Red bumps on the arms are a fairly common occurrence among all age groups and can be caused by a variety of factors. Possible causes include food allergies, irritant contact dermatitis, heat rash, sun allergy, autoimmune conditions such as psoriasis, viral or bacterial infections, fungal infections of the skin and even injuries or benign skin growths. Appearance may vary depending on the causative agent. As such, red bumps on the arms may vary in size, shape, color, elevation and other characteristics. Affected areas may be limited to a small portion of skin, sometimes bumps occurring singularly such as cherry angiomas. Other times almost the entire upper arm or forearm may be affected, although it is more common for dots, spots and bumps to occur on the exterior upper arm or forearm rather than on the interior. Rashes and infectious conditions are more likely to affect extended portions of skin on the arm. 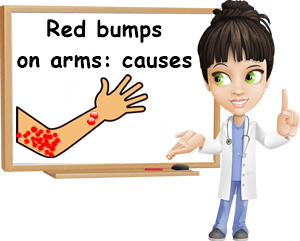 Treatment of all types of red bumps on the arms starts with seeing a dermatologist for diagnosis. Once the cause is identified, the dermatologist will recommend several treatment options for you as well as offer advice on how to manage symptoms and prevent the recurrence of the bumps in the future. Probably the most important thing to remember about all kinds of dots, spots, bumps or growths on the skin, whether they occur on the arms, abdomen, legs, face, neck or scalp, is to monitor their evolution. Maybe keep a photographic diary of existing spots or bumps and see a dermatologist if they seem to change color, grow, bleed, develop fluid, itch, break open or extend to other portions of skin. But what are some of the most likely causes? What causes red bumps on arms? 1) Heat rash (cholinergic urticaria). Heat rash is basically an allergy to one’s sweat. What happens is the body produces histamine in response to a person’s own sweat, causing a hypersensitivity reaction that manifests in the form of a skin rash. Small, red, raised, itchy bumps on the arms and legs, torso (chest, stomach, back) are common. Large swelling (wheal) may also occur and cause burning sensation and pain. The rash may be local, limited to the arms, sometimes only the upper arms, or generalized, affecting more areas of the body at once, usually areas of the skin that sweat a lot. People with the condition may notice random red bumps on their arms as soon as they feel too hot or start to sweat and the perspiration drips down on the arms. At this point, it’s best to look for ways to cool down, such as air conditioning or use a cold water spray. Fortunately, the condition is temporary and the skin reverts to its normal appearance and feel as soon as you cool down and stop sweating. Heat rash from sweating can be caused by exposure to high environmental temperatures (spending time outdoors in hot weather, working or spending time in a hot environment, without air conditioning), intense physical activity (exercise), emotional stress, anxiety, showering with hot water or a condition called generalized hyperhidrosis. Avoiding hot environments and physical effort that raises core body temperature can prevent a skin rash from sweating. 2) Sweat rash (miliaria). Sweat rash is a skin condition that causes either small, skin-colored, blisters or slightly larger, but still small, red bumps filled with fluid on arms, the elbow crease, chest, stomach, back, neck, face or thighs. The first look like tiny droplets of perspiration, while the second look like a severe rash. The condition is caused by obstruction of the ducts of sweat glands which causes sweat to infiltrate into various layers of the surrounding skin (in the outermost layer of the epidermis in the case of the clear blisters and in the innermost layers of the epidermis in the case of the red blisters). The redder bumps on the skin cause itching and generate serious discomfort, even pain. Repeated episodes predispose to complications like deeply seated obstructions in the ducts of the sweat glands, pain and skin infections. – Avoiding heat-inducing, sweat-causing activities. – Avoiding hot environments or resorting to air conditioning. – Wearing light, loose-fitting clothing from natural fabrics like cotton. – Avoiding fabrics that cause itching (example: wool). – Taking more frequent showers with cool water, using clean, damp towels to cool down etc. – Water-based preparations for reducing itchiness. 3) Allergic reactions. When I was little, eating eggs and strawberries caused me to develop small, red bumps on my arms in less than a minute, followed by a few spots on my cheeks. These disappeared in about 2-3 days on their own if I didn’t eat these foods anymore. A lot of allergic reactions to food, medicine, pollen, insects bites or stings cause itchy red bumps on the skin, in particular on the upper arms, stomach, chest or back. The allergic reaction may be restricted to one of these areas or just start there and expand. A person may be allergic to various ingredients in skincare products, irritants from the hairs or prickles of various plants, detergents, fabric softeners, household cleaning products etc. Direct contact will trigger an almost immediate allergic response in the form of small, red, raised, itchy bumps (hives) or paler red, rounded, inflammatory skin bump (weal). 4) Non-allergic contact dermatitis. Tiny red dots that itch are often a sign of contact dermatitis. Insect bites or stings on the arms, contact with irritant chemicals such as detergents, dish soaps, fabric softeners or various cleaning products, skincare products (lotions, creams), plant hairs, prickles or various milky saps and all sorts of irritants can cause localized rashes on the arms. For example, I always get small, red, extremely itchy bumps on the inside of my wrists from dish soaps, so I have to use gloves for washing dishes. The irritation lasts about two days in my case. 5) Acne. Although less likely, it is possible to get acne on the arms, especially on the exterior upper arms, but also an occasional zit on the more sensitive skin on the interior of the arm. Hormonal imbalances are the first and most likely cause of acne on the body, but also poor hygiene. Acne brought on by hormonal factors can cause red cysts (bumps with fluid) or papules (bumps without fluid) in the skin that are painful to the touch. Lack of hygiene can also cause smaller, red bumps on the arms, usually with infected fluid (from bacteria). 6) Sun allergy. Sun allergy is essentially an itchy red rash on the skin that appears following sun exposure. It affects skin exposed to sunlight such as the arms, hands, upper part of the chest and back, forehead, cheeks, nose. It is also commonly triggered by certain medication or foods that increase skin sensitivity to sunlight. A sun allergy rash looks like tiny, red bumps that are so close together they seem to merge into a larger rash. Itching, burning sensation, pain, blistering, bleeding may occur, depending on the severity of the sun allergy. 7) Insect bites and stings. The arms are a common site for insect bites and stings, especially in warm weather when short sleeves are worn. Whether it’s bees or wasps, ants, spiders or mosquitoes, insect bites and stings are painful and cause an inflammatory reaction in the skin at the site of the bite or sting. There is usually redness, followed by inflammation, pain and itchiness. It may take a couple of days and up to a week for the redness and inflammation to subside. A singular, circular bump the same color as the skin, with a red outline is fairly common. If a larger rash forms, it is best to seek medical help because it may be an indication of an allergic reaction. 8) Cherry angioma. Also known as red moles or strawberry marks, cherry angiomas are benign (harmless) skin growths of a bright red color. They are essentially made out of tiny blood vessels. They can be flat and as small as a dot or slightly larger and elevated like a dome (basically a round bump without liquid) and can appear anywhere on the skin (even on fingers). Cherry angiomas are common on the arms, especially on the exterior, from shoulder to fingers. 9) Keratosis pilaris (chicken skin). Those small bumps a lot of people seem to have on the backs of their upper arms are called keratosis pilaris. The condition causes raised, rough skin on various areas of the body (especially back of upper arms, legs and bottom area, back and face). The bumps may be skin colored or red and are not always itchy, although excessive sweating, clothes rubbing on the skin and various irritants can make them be. Scratching promotes inflammation and infection. Keratosis pilaris looks like small, round, rough bumps on the surface on the skin and is caused by excess production of keratin, a type of protein that makes of skin. Keratin builds up and blocks the hair follicle, preventing hairs from growing and causing a bump in the skin. The condition is harmless. How to get rid of keratosis pilaris? Keratosis pilaris may improve greatly with age in some people. However, if it persists, laser treatment, creams used for treating various skin growths, gentle exfoliation, moisturizing lotions, adequately caring for your skin in cold weather can help improve appearance. 10) Folliculitis occurs when hair follicles become infected and inflamed. Staphylococcus aureus, Pseudomonas aerugionosa, fungi, yeasts, mites and all sorts of microorganisms can cause infection at the level of the hair follicle. Red, inflamed bumps filled with yellowish fluid may occur on the arms, especially the outer arm as well as on the face, back, chest, abdomen, legs and scalp. Foliculitis is similar in appearance to acne and severe forms can cause large, inflamed patches of skin. Depending on what is causing it, antiseptic, antibiotic, antifungal medication may be advised. 11) Molluscum contagiosum (water warts). Causes small, pale red or pink elevated lesions with a characteristic dimple in the middle, somewhat similar to skin tags. Can occur on face, neck, arms, torso, legs and virtually any part of the skin. Molluscum contagiosum growth are caused by a virus and are infectious. They spread via direct contact or use of personal objects. However, they usually resolve themselves in up to two years. 12) Chicken pox causes itchy, pink and red, raised bumps on the skin with fluid-filled blisters. The blisters will break open followed by crusting and healing, all of which occurs over the course of several weeks. The first few bumps may appear on the abdomen, chest, back or arms. Chicken pox is an infectious disease caused by the virus called varicella zoster virus. 1) Itchiness: Red itchy bumps on arms may indicate allergy to food, sunlight, sweat, irritant contact dermatitis or infection (example: chickenpox, acne, folliculitis). 2) Fluid presence: Small itchy bumps on the skin, filled with fluid often indicate infection. 3) Lack of itchiness: Numerous red dots on arms that are not itchy may hint at non-infectious causes (example: keratosis pilaris, cherry angioma). 4) Mole-like appearance: Random red bumps on arms of a bright cherry red, similar to moles, are called cherry angiomas and are harmless. 5) Wart-like skin growths are possibly contagious. 1) Topical antiseptics, antibacterial agents or antibiotics for bacterial infections (Example: acne, folliculitis). 2) Antifungal medication for fungus or yeast infections (Example: folliculitis). 3) Removal of skin growths with the help of laser therapy (Example: water warts, sometimes keratosis pilaris bumps or cherry angiomas). 4) Topical ointments for softening skin (Example: keratosis pilaris). 5) Good hygiene: wash hands well with soap and water, keep nails short, avoid biting nails, take a shower as often as needed, do not share personal objects such as towels, brushes etc. 6) Avoid irritants and possible allergens, including excessive sweating and sunlight. 7) Calamine lotion and other anti-itch products may help reduce itchiness (Example: good for allergic dermatitis, irritant dermatitis, insect bites and stings, chickenpox). 8) Use non-allergenic detergent, fabric softeners, wear gloves when washing dishes or using strong disinfecting household cleaning products. 9) Wear loose-fitting clothes from natural fabrics that don’t irritate skin. Shower and change clothes more often if you sweat a lot and use warm or cool water, not hot water. 10) Limit activities that raise core body temperature and produce sweating if you have heat rash or sweat rash and avoid hot environments. 11) Avoid questionable home treatments (example: treating moles or warts with apple cider vinegar) and talk to a dermatologist about the best treatment options for you. 12) Learn about your condition and what it is you need to do to manage it and its symptoms. Example: using appropriate skincare products, avoiding certain ingredients in skincare products, having essential medication for allergies.